**Click on the chart for a larger version. Job Security and TA Allocation: Having job security and allocation practices written into a collective bargaining agreement means that you are always sure of what income you will be guarantee throughout your degree.You won’t be surprised by not receiving the TA or RAship you were counting on. Making ends meet as a graduate student can be difficult, but with job security provisions, you can go into your degree with guaranteed employment. That does not limit your capacity to take on additional TA or RA work either – it provides a baseline. Currently, the TA allocation process varies in each department, and even within departments. Unionization would make the process more fair and transparent. Extended Health Benefits: Currently, we are covered by the GSA health plan, which we pay for ourselves. Many TAs and RAs feel that this plan is not sufficient. What many unionized TAs and RAs have bargained for is University contributions to an amalgamated GSA-Union extended health and dental plan. This contribution can mean adding supplementary medical care to your benefits, as well as better coverage for prescriptions, dental, glasses and physio. What many Unions have done is set up Health Care Spending Accounts so you can use the extended benefits in a way that fits what you (and your family) need that year). Even if the university contributed $200 per graduate TA and RA, that would only be 0.035% of their projected operating budget. This would give you access to way more than that in value. Minimum Pay Rate and Guaranteed Increases: Currently, the advertised rate of pay for TAs at the University is $18.51. However, we’ve talked to people who receive less, or whose contracts do not cover the number of hours they are actually required to work each week. Even at $18.51, we still make one of the lowest wages of graduate TAs across Canada. Moreover, we are not guaranteed increases to keep up with inflation and the rising cost of tuition. Unionized TAs have the right to bargain for this protection. And, looking at what other TAs in Canada have achieved, it is reasonable to expect that we can do the same when unionized. Intellectual Property, Academic Freedom, Anti-Harassment and Discrimination: Currently, we are only covered by University policies on these issues. These policies are not enforceable, meaning we can’t make the University pursue a case they don’t want to. They retain the right to help us, or not. And if you wanted to pursue an issue, you would have to navigate the process and represent yourself without any help. With issues of power, so often, our rights are left out of the picture. Unionization would mean that we would have access to representation and resources from the Union. The Public Service Alliance is experienced in dealing with workplace issues and representing members through all steps of the process. They can do so with you, or on your behalf. Unionization would also mean that you have legally-protected, enforceable rights. You can bargain for the right to keep all intellectual property you develop in your capacity as a teaching assistant. You can protect your right to academic freedom. You can your assert your right to a workplace free from harassment and discrimination. Protected Leaves: Many unionized TAs and RAs have negotiated protected leaves so that they are not penalized for needing to take time away from their duties. These can include academic conference leave, letting you balance your academic life with your work for the University; sick leave, bereavement leave and compassionate care leave so you can take care of yourself and your family if you need to; and various kinds of parental leave so you can balance work and home life. Maternity, paternity and parental leave looks different at different unionized Universities. Some graduate employees have access to employer contributions into their maternity leave. Others are simply protected so they don’t lose seniority or opportunities to work when coming back from leave. Some unions have also negotiated exchange of duties provisions so you can manage unexpected obstacles without fear of losing your TA or RAship. Grievance Procedure: Union members have the right to a grievance process to address issues in their working conditions. The procedure begins informally, seeking to settle issues at a low-stakes level, in a way that is agreeable to all parties. It can become formal if you as the griever are dissatisfied with the informal process or if the University does not want to cooperate. A union steward or a PSAC staff member will be there to advise and represent you. Finally, if the formal process has still to brought resolution, it can go to the level of the provincial Labour Board, at which time you would have access to PSAC resources. It is rare that grievances are brought to this level. They are usually settled informally. All grievances result from a breach of the collective bargaining agreement. For graduate student employees, this could mean being denied a TAship/RAship promised in your academic letter of offer, not being paid for overtime worked, or experiencing discrimination or harassment at work. In many cases, the existence of a collective agreement stops grievances before they start. Currently, if we are asked to perform tasks that weren’t part of the original TA or RA form (which often aren’t even filled out), we have no leg to stand on to say no. 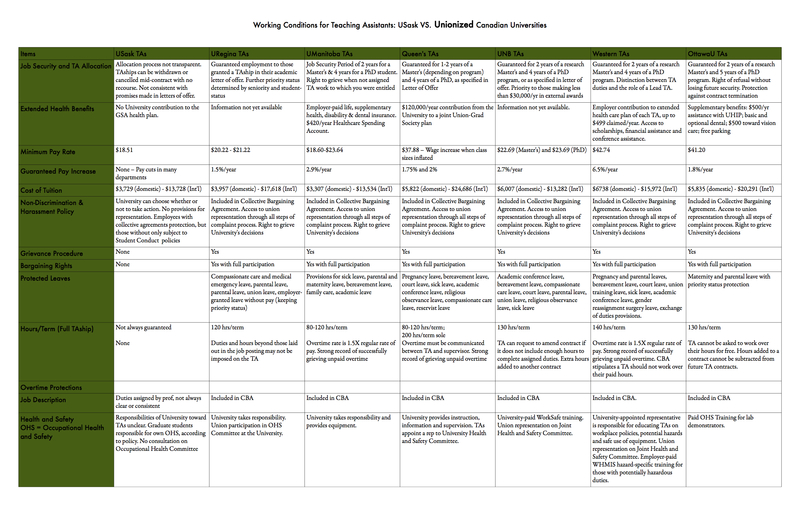 With a union, we can point to a clear, concise document that helps both the graduate student and their supervisor appropriately allocate work. This doesn’t mean that you lose flexibility or the chance to distinguish yourself. This simply means that if you don’t want to teach an extra lab for free, wash dishes or walk your supervisor’s dog, you can say no without any hard feelings. At the bargaining table, we meet the University as equals and both of us are compelled to bargain in good faith. Health and Safety: Currently, there are no enforceable standards to protect our health and safety at work. This means that in the lab, in the field, and in the office, many TAs and RAs were not taught how to safely operate the equipment they use, or were not taught their lab’s safety protocols in case of emergency, or are working in offices with mould and mice. Without even a mechanism of feedback, we have no recourse. Unionized graduate employees have representation and a voice on campus Occupational Health and Safety Committees, as well as someone dedicated to making sure they are safe at work. This does not mean that the “safety police” will come into the lab and tell you how to do your work. It simply means that you will have legally protected and enforceable rights.